I recently received an 30GB iPod Video (5G) and have learned to enjoy using it. However, the one thing which ticked me right off on opening the package was that Apple have gone all cheap with their bundled accessories by providing only the most basic of protectors. In the case of the 30GB iPod, the 'protector' is a rudimentary white vinyl sleeve. It's just not good enough, and after a few weeks I decided to look into model-specific, third-party cases. Quite by chance, I came across a company called Vaja which is based in Argentina. The company makes a range of device cases including some very nice models for mobile phones. I found several designs all of which appealed to me, but the model chosen for this review is the AP186 Custom Leather Flip Case in a two-tone mixture of red and black leather. I was impressed even before I opened the box as Vaja have spared no expense when it comes to presentation. The AP186 case arrived in a white box varnished with the Vaja logo, containing the case and a mini-folder full of well produced brochures of Vaja's products. Some part of the AP186's cost is no doubt the result of its elegant packaging, but it's also true that despite being an experienced reviewer I was nonetheless immediately enamored with the product. Presentation is no joke and the Vaja packaging makes you want to like the product inside. The Vaja flip case itself is well constructed and fits snugly around my 5G iPod. The first impression the case provides is that of a beautifully made product, well stitched and well fitted to the iPod. There is a clear protector for the iPod screen and the click wheel is easily accessed. Although an additional protector is available for it, I couldn't really see the need as the flip case more than adequately covers and protects the iPod control surfaces. The cutout for the iPod dock cable is well situated and allows the connector to sit snugly against the iPod without any physical interference. My only concern with the case was that although the flip has a cutout to allow the headphone jack to protrude, it doesn't permit access to the Hold button when the flip is closed. I found the case fit comfortably in my hand and when held right, I could use the flip to shade the iPod display when using it in bright sunlight. The magnetic closures are well situated and do not spoil the lines of the case whatsoever. The closures also perform admirably. Removing the iPod was easily facilitated by pushing on the bottom of the device which then pushes up through the top of the case. Vaja offers three different types of clip systems: a high quality system called the Ultraclip, a rivet-based clip system, and a metal hook which is sewn permanently to the back of the case and allows you to hook the case to a belt loops. I did not bother with a clip system, as I'm perfectly happy keeping the iPod in one of my many utility pockets. Although the case will not protect the iPod from a fall from a great height, it has already protected my unit from a couple of shorter drops. The strength and rigidity of the flip cover also prevents all but the most concerted efforts from accidentally activating the unit when the flip is closed. I did find that I somehow scratched the case, probably from placing it in a pocket being shared with a set of keys. Although I had no major concerns with the case design, attractiveness and usability, one general concern may be the price. 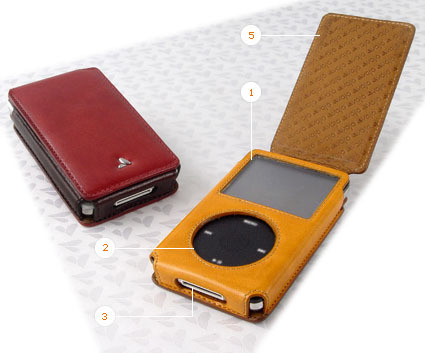 It's true that many iPod owners will note that other leather flip cases retail at between one-third and two-thirds the cost of the Vaja models. That said, a direct comparison between iPod case models from Bellagio or EB Cases and the Vaja AP186 is no contest at all—the Vaja is functional and remarkable looking, and embodies a unique design. The Bellagio and EB models are functional enough but look utterly coarse by comparison. Vaja only sell direct to the public via their web site. They have no plans at the moment to work with distributors or representatives as their web presence more than meets their goals. The web site offers extensive order customization, with options available for personalization, an embossed logo, material, color choices for a one color or two color finish and clip style. Cons: Hold button not accessible when flip is closed. Price is notably higher than the competition. As with all leather cases, it's susceptible to minor scratches. Pros: Beautifully designed, finely made and finished. Performs admirably and protects your iPod well. Excellent range of colors available for custom configuration. In all situations the case performed admirably and I've enjoyed using it with my iPod. Although the case isn't designed to provide heavy duty protection, it more than meets my needs. The AP168 is an all round winner, aesthetically, functionally and structurally. Vaja could easily produce licensed versions of their products which people would happily snap up. I for one will look at picking up a couple more cases from Vaja—the iVod Video SP looks particularly nice and I'm also waiting for them to release a cover for the new Motorola Razr V3i case. Highly Recommended.